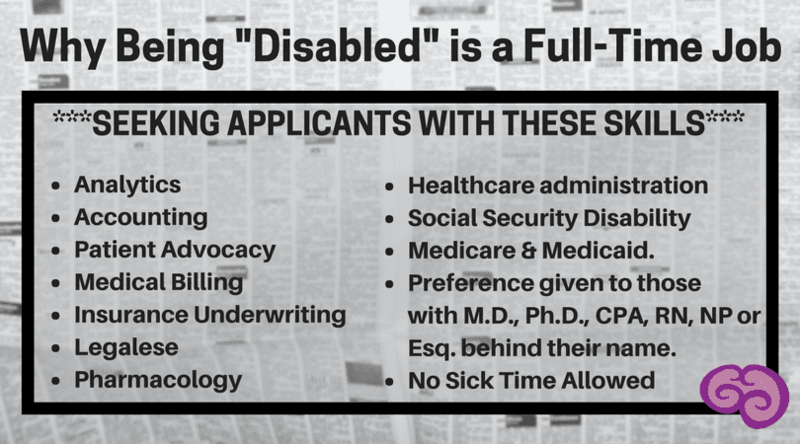 Prerequisite: Ideal candidate would have a background in all of the following areas: analytics, accounting, patient advocacy, medical billing, insurance underwriting, legalese, pharmacology, healthcare administration, Social Security Disability, Medicare & Medicaid. Preference for those with M.D., Ph.D., CPA, RN, NP or Esq. behind their name. Skills: The ideal candidate would be well organized, exhibit patience, possess a friendly phone manner, anticipate problems, show initiative, diligent in finding correct answers and keep meticulous notes. *Candidate must be able to perform these functions regardless of, and in spite of, his or her health condition at any given time. *Candidate is also expected to maintain all household duties such as cleaning, laundry, cooking, parenting and managing relationships. *No training is available for employees. *If you are unable to perform your duties, you must nominate a loved one to take over your duties. *Inability to master all of these skills can result in loss of benefits, health insurance and access to care. Candidate will only receive insurance benefits and compensation if he/she is able to complete the tasks above. Lapse in attention to these details could result in loss of benefits. Sick days and vacation days will not be offered however candidates will be able to work from home. Chief Medical Officer of Personal Health Affairs is a title befitting for those who are applying for or are maintaining Social Security Disability benefits. There are 8.8 million Americans employed in this job, with another 2 million having applied with no response or are actively appealing a denial. No one could ever be prepared to perform all of the job duties listed above, but we don’t have a choice. No one ever grows up saying, “I want to be disabled.” Some people go to school for multiple years to master just one of the dozens of areas that we have to learn as a trial by fire. The description and pre requisites is not an exaggeration of the skills needed to effectively manage the Social Security Disability system. Having an accounting degree, a background in law, and a medical license would be the right combination of a perfect candidate. Being disabled is a full-time job. The amount of time it takes to stay on top of your health and keeping up with paperwork while feeling the worst you ever have in your life is all-consuming. The next time you hear that those on Social Security Disability are “milking the system,” or we “need to take ownership for our health,” remember that being disabled is a full-time job. And we are some of the hardest working people you may know. The American Migraine Foundation has a downloadable guide for applying for disability benefits here. ← How Do YOU #MoveAgainstMigraine? On Tuesday and Wednesday of this week, Health Union (parent company of Migraine.com) invited all the HQ staff, writers and moderators to join together for the first time at their new space in Philly. One of our co-founders said it best- “Welcome Home.” And that’s exactly what these 2 days felt like. Roni! Thanks so much. We never thought we’d need to learn these skills and I wouldn’t wish it on anybody. We’re lucky that we’re very Type A personalities, always organized and doing the research to understand what’s needed. Many people who SHOULD be receiving SSDI just don’t have the resources to navigate this fairly complex system, especially when they are in so much pain! We are definitely professional patients! I’ve never looked at being disabled that way before, but I have to say you hit the nail right on the head. Several of these areas can be quite daunting, if you’ve never had any experience with them before. Insurance EOB’s can be confusing and Medicare’s are the worst. Filling out the paperwork for Social Security Disability, can leave you feeling as if you climbed Mt. Everest! I had helped my Mom through this process, when she started to become ill from Polycystic Kidney Disease and could no longer work. Once she went into renal failure, she automatically became eligible. When I lost my job in 2001 to chronic migraine and realized in 2003 that I wasn’t going to be able to return to work. I knew a few tricks from helping my Mom, fill out those tedious forms. Make copies of everything you send in, sometimes they send additional forms and it can be difficult to remember exactly how you worded questions you were asked before. The more medical records you have to support your claim the better. Stay on top of Dr.’s offices if the are being slow in sending your records. I was approved the first time I filed, though everyone told me there was no way that would happen. People are often wrong, don’t lose hope.